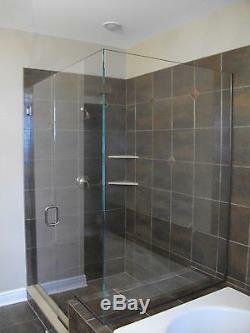 FRAMELESS SHOWER DOOR, PANEL AND RETURN IN 3/8 GLASS. EXCEPT CERTAIN LOCATIONS (NM, CO, MT, ND, SD, NE, FL, AK, HI)... 3/8 THICK CLEAR TEMPERED SAFETY GLASS. DOOR WIDTHS: 24", 26" AND 28" AVAILABLE IN 72", 73", 74", 75", 76", 77", AND 78" HEIGHTS. DOOR WIDTHS: 24 1/2", 25", 25 1/2", 26 1/2", 27", 27 1/2" AVAILABLE IN 72" and 75" HEIGHTS. FRONT OPENING WIDTH: UP TO 60 WIDE. RETURN PANEL DEPTH: UP TO 48 DEEP. (2) HEAVY DUTY WALL MOUNT HINGES. (1) 6" TUBULAR BACK TO BACK "C PULL. (1) 90 DEGREE SLEEVE OVER CORNER SUPPORT CLIP. (1) CLEAR POLYCARBONATE DOOR SWEEP. 3/4 U-CHANNEL FOR BOTTOM & WALL SIDE EDGE OF FRONT AND RETURN PANELS. HARDWARE FINISH - CHROME or BRUSHED NICKEL. (1) STEP UP NOTCH CUT IS INCLUDED IN THE PRICE. OUT OF SQUARE ANGLE CUTS ARE NOT INCLUDED IN THE PRICE. Carefully inspect the outside of the packaging for any visible damage. We are committed to ensuring that your order is processed and packaged correctly so that it arrives to you safely and completely. After this period of time, you will be responsible for any damaged or missing goods. And we will assist you in processing your claim. Emailed pictures of the damage would be helpful in expediting your claim. We kindly ask for your patience while processing any claims. With 60 years in the glass business and 30 years in the shower door business, we have learned how to engineer products in the most cost effective manor to create. In a joint venture with many of our manufacturing partners we are happy to present these products. The item "FRAMELESS 3/8 GLASS SHOWER DOOR, PANEL AND RETURN" is in sale since Wednesday, October 28, 2015. 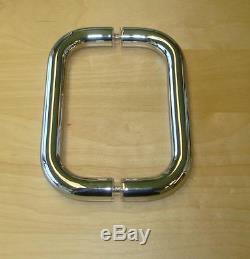 This item is in the category "Home & Garden\Bath\Other Bathroom Items". 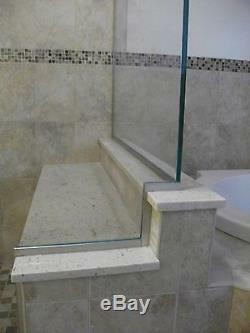 The seller is "rexglassandmirrorcompany" and is located in Pittsburgh, Pennsylvania. This item can be shipped to United States.